The Bible explains in several places that signs in the celestial bodies would be of prophetic importance. One of these signs is the moon ‘turning into blood’. NASA has stated that there will be four blood moons occurring during the Jewish Feast days, with a solar eclipse occurring in the middle, between 2014 and 2015. Surely an occurrence like this would be tied to a great prophetic fulfillment. Four blood moons on Jewish Feast days in back-to-back years is very rare. In fact it has only occurred seven times since the birth of Jesus. The four blood moons scheduled to appear in 2014/2015 will appear during the Jewish Feasts - and there are none predicted for the following 100 years. In May 2012, God gave me a prophetic exhortation and warning to “get ready, something big is coming”. By a series of miracles, that word has since been circulated to thousands of churches globally. The punch line is that, whatever it is that’s going to happen, it is centered on the year 2015. In addition to myself, there are several others in the U.S. that received the exact same message and others that, although different in nature, concur with ‘something’ happening in the year 2015 – among them Rabbi Jonathan Cahn, author of “The Harbingers” and John Hagee of Christians United For Israel. . In fact, there was recently a panel including Dr. Paul Crouch, Jonathan Cahn, Bill Salus, Dr. Raafat Girgis and Reza Safa discussing this very thing. We also believe that the upcoming blood moon occurrences of 2014-15, specifically, have something to do with whatever the ‘something big’ is. Bible scholars have taken the predictions of four blood moons and crossed them with the prophecies of the Bible. Initially, some claimed that the Second Coming of Jesus Christ would take place during this eighteen month span. More recently, it has been thought that the four blood moons are a sign of judgment to the world, foreshadowing a devastating war prophesied by the prophet Ezekiel. Whatever the meaning, every single time in history that a blood moon pattern has appeared on Jewish feast days it has a significant event affecting the nation of Israel. Historically, there are ‘pre-events’ leading up to the main event affecting Israel, which begin just before the actual years the blood moons fall in – like tremors that precede a volcanic eruption. To understand what will happen in the 2014 - 2015 “blood moons” you must understand the pattern of blood moons in the past. Four PARTIAL lunar eclipses occurred on the Jewish Passover in 32 AD – 33 AD and the "Feast of Tabernacles" in the years before and after the Crucifixion of Yeshua HaMashiach (Jesus Christ). The world has since witnessed seven "Tetrads" coinciding with events impacting Jewish and Christian culture. · Four TOTAL lunar eclipses occurred on the Jewish Passover and Feast of Tabernacles in 162 - 163 AD, coinciding with the worst persecution of Jews and Christians in the history of the Roman Empire. Within 3 years the Antonine Plague killed eight million people - a third of the population! · Four TOTAL lunar eclipses occurred on the Jewish Passover and Yom Kippur Holidays in 795 - 796 AD while King Charlemagne of the Holy Roman Empire established a ‘demilitarized zone’ between France and Spain, ending centuries of Arab invasions into Western Europe, protecting a very large Jewish population in Spain. · Four TOTAL lunar eclipses occurred on the Jewish Passover and Yom Kippur Holidays in 842 - 843 AD. Shortly after the eclipses, the Vatican was attacked and looted by an Islamic invasion from Africa. · Four TOTAL lunar eclipses occurred on the Jewish Passover and Yom Kippur Holidays in 860 - 861 AD. The tetrad took place just after millions of Christians were killed by Arab crusaders in North Africa and Spain. The Jewish Holiday tetrad occurred just prior to the Greek – Byzantine Empire victory over the Arabs at the Battle of Lalakaon. · Four TOTAL lunar eclipses occurred on the Jewish Passover and the Feast of Trumpets Holidays in 1493 – 1494. A few short months following, King Ferdinand and Queen Isabella of Spain ordered all Jewish people out of the country after they had developed a second homeland there for over 1,000 years. These Sephardic Jews were then scattered (again) to all parts of the world – with heavy concentrations in Central and South America and Mexico. *The list of Spanish (Sephardic) surnames is extensive, but includes very common names like Diaz, Perez, Rodriguez and Marcos. Christopher Columbus’s diary begins with the statement, “In the same month in which their Majesties issued the edict that all Jews should be driven out of the kingdom and its territories, they gave me the order to undertake with sufficient men my expedition of discovery to the Indies.” This expedition was largely funded with Jewish money. It is easily understood that the year 1492 has been just as important in Jewish history as in American history. On July 30 of that year, the entire Jewish community, some 200,000 people, were expelled from Spain. Tens of thousands of refugees died and, in some instances, Spanish ship captains charged Jewish passengers exorbitant sums, then dumped them overboard in the middle of the ocean, to a certain death. Things were so brutal in the last days before the expulsion that rumors spread throughout Spain that fleeing refugees had swallowed gold and diamonds in an attempt to smuggle something of value out with them. As a result, there were thousands of Jews knifed to death and disemboweled in hopes of finding treasures in their stomachs. Like Mordecai said to Esther – “help will come in another way!” - today, the United States is home to over five million Jews. More important we believe that America’s purpose was to protect Israel and offer a safe haven for the Jewish people. The question troubling Christian and Jew alike today is how long will America continue to extend our friendship, loyalty and protection to Israel? The second we turn our backs on Israel, the United States is doomed. · Four TOTAL lunar eclipses occurred on the Jewish Passover and Feast of Tabernacle in 1949 - 1950 during the 1st Arab - Israeli War for Independence. On 14th May, 1948 Israel proclaimed its independence. Less than 24 hours later, the armies of Egypt, Jordan, Syria, Lebanon, and Iraq invaded the country, forcing Israel to defend the sovereignty it had regained in its ancestral homeland. In what became known as Israel's War of Independence, the newly formed, and poorly equipped Israel Defense Forces (IDF) retaliated in fierce fighting that lasted 15 months and claimed over 6,000 Israeli lives - one percent of the country's population at the time. Israel had a transitional government in 1948 so the first permanent government took office on January 25th, 1949. The four blood moons tie to the birth year of Israel in 1948 and to the first elected government in 1949. During the first months of 1949, direct negotiations were conducted under United Nations auspices between Israel and each of the invading countries (except Iraq, which refused to negotiate with Israel), resulting in armistice agreements. As a result, the Coastal Plain, Galilee and the entire Negev were within Israel's sovereignty, Judea and Samaria, in the West Bank, came under Jordanian rule, the Gaza Strip came under Egyptian administration, and the city of Jerusalem was divided, with Jordan controlling the eastern part, including the Old City, and Israel the western sector. After the war, Israel focused on building the state which the people struggled so long and hard to regain. The first 120-seat Knesset went into session following national elections in which nearly 85 percent of all eligible voters cast their ballots. Two of the people who had led Israel to statehood became the country's leaders: David Ben-Gurion, head of the Jewish Agency, was chosen as the first Prime Minister; and Chaim Weizmann, head of the World Zionist Organization, was elected by the Knesset as the first president. On 11 May 1949, Israel took its seat as the 59th member of the United Nations. · Four TOTAL lunar eclipses occurred on the Jewish Passover and Feast of Tabernacle in 1967 - 1968 coinciding with the ‘6 Day War’, when Israel recaptured Jerusalem. When Israel's neighbors prepared to destroy the Jewish state, Israel invoked its right of self-defense and launching a daring pre-emptive strike, on June 5, 1967, against Egypt in the South. This was followed by a counter attack against Jordan in the East and the routing of Syrian forces entrenched on the Golan Heights in the North. At the end of six days of fighting, previous cease-fire lines were replaced by new ones, with Judea, Samaria, Gaza, the Sinai Peninsula, and the Golan Heights under Israel's control. As a result, the northern villages were relieved from nineteen years of Syrian shelling, Israel-bound shipping, through the Straits of Tiran, was ensured and Jerusalem, which had been divided under Israeli and Jordanian rule since 1949, was reunified under Israel's authority. Jesus told His disciples what would be the signs of the end of the age and some of them involved signs in the heavens. He closes commanding them to ‘watch’ four times. To be a "Watcher, and observe what is happening in the heavens" relating to the Last Day, when "unusual signs" are seen in the heavens we watch, pray and record. 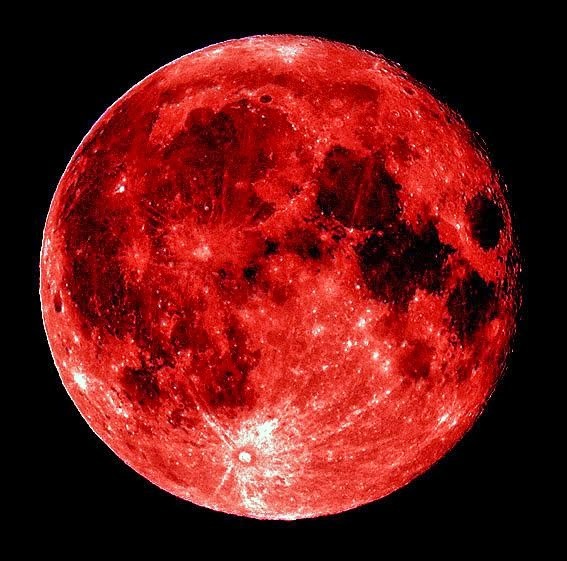 · Are blood-red moons prophetic in Scripture? Yes! Joel 2:10, 31; Acts 2:20; Revelations 6:12. Jesus spoke those words after He warned us of many of the events that will happen in the end times. They are especially relevant to us today when we consider current headlines are now fulfilling Bible prophecy at an absolutely amazing rate — which is setting the stage for more ominous events to happen at any time. The signs are sometimes obvious, such as rumblings in the Middle East, economic turmoil, shifts in geopolitical policy, earthquakes, signs from heaven, and more. At other times, the clues are more subtle, yet equally astounding to those who know Bible prophecy. 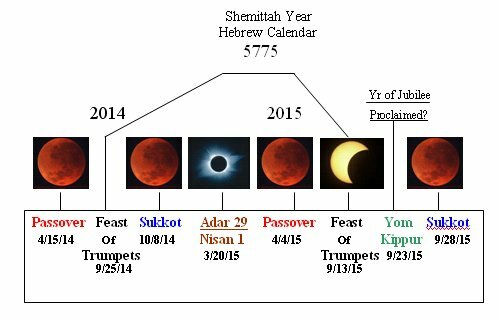 It cannot be regarded as coincidence that all four blood moons of 2014-15 occur on religious festivals of Israel, together with two eclipses of the sun also on important days in 2015. A blood moon will occur on the 14th day of Nisan in 2014, when the Passover will be celebrated in Israel (Leviticus 23:5). Nisan is the first month in Israel's religious calendar. On the 15th day of the seventh month (Tishri) when the Feast of Tabernacles begins (Leviticus 23:34) there will be another blood moon. Exactly the same pattern will be repeated in 2015. Because of Israel's lunar calendar these dates all coincide with the full moon - on these occasions the moon will become blood-red. Apart from the lunar eclipses there will also be two eclipses of the sun in 2015 - on the first day of Nisan and again on the first day of Tishri. The Rosh Hashanah (Jewish New Year) is celebrated on 1st Tishri, which is the beginning of their civil calendar. Repeated calls by radical Muslims for a world-wide jihad are now heard everywhere - from Iran, Syria, Lebanon, Afghanistan, Pakistan, Egypt, the Palestinian territories in Israel, and even from Muslim groups in London. The scene is set to launch a major attack against non-Islamic infidels. The suicide bomb mentality of these terrorist Islamists has over and over demonstrated that they have a fanatical, religious-driven hatred for their enemies and will not hesitate to plunge the whole world into chaos! Israel still remains their most important target, but the Lord will not allow them to annihilate His people. According to; Psalm 83 Israel’s surrounding Arab enemies and Ezekiel 39:1 - 5 radical Islamist Muslims who will invade Israel under the leadership of Russia (Magog) will be destroyed on the mountains of Israel. That, together with the rapture, will bring about the end of the church dispensation and offer the Antichrist the opportunity to be revealed as Satan's world leader. If it does line up with Israel fleeing into the wilderness, Israel will see the eclipses occurring on their feast days to show them that the time for their redemption is near. The heavens, the earth, the sun, the moon and the stars are totally controlled by his power. The story of Joshua, Hezekiah and the three wise men following the star to Jesus serve as scriptural validation of this fact. Genesis 1:14 states that God has put lights in the firmament and let them be for "signs." In fact, the Hebrew word for "sign" is "owth" which means also "a signal." In biblical prophecies there is a direct correlation between signs in heavenly bodies and distressing events happening on earth…. We are rapidly approaching the time of the fulfillment of these signs. These four TOTAL lunar eclipses and two solar eclipses will occur on the Jewish holidays of Passover, the Feast of Tabernacles (Feast of Booths) and the Feast of Trumpets. This is the only tetrad in the next 100 years that aligns itself with the Jewish holidays. Putting everything into perspective, the coming 2014 tetrad will be tied to some major event dealing with Israel This also means that the blood moons of 2014 - 2015 will be a time of war or persecution for the Jewish people. This may Lead Israel to gain and/or loose land during this time. Throughout 2011 there was been war and crisis in the Middle East that has ignited violence and uprisings in Egypt, Libya, Syria, Yemen and other Middle Eastern nations. There is also the threat of a nuclear Iran. Meanwhile, the Obama administration of America has increased the leadership of the Muslim brotherhood, creating a more fanatical terrorist state that threatens Israel’s existence as a nation. As of 2012 the world is on the edge of a financial collapse that could destroy the economy of Europe and America, one of the lone supporters of the nation of Israel - and President Obama has declared the position of the United States is to divide the land of Israel to pre-1967 borders for the creation of a Palestine state within Israel. 2013 through 2014 will provide the leading events for the next 2014 - 2015 blood moons that are predicted to occur. With the deterioration of Egypt, and talk of bombing Syria, these events may involve war in the Middle East and a financial crisis around the world that will affect the land of Israel and the Jewish population globally. In February of 2013, Iranian President, Ahmadinejad visited Egypt and received a welcome from Morsi the Egyptian President and the Muslim Brotherhood – and made renewed calls for the complete annihilation of Israel - so it doesn’t matter who wins in the current situation there, they will have an ally. At the same time that all that was taking place, Obama visited Israel in March, for the first time since he was a candidate for President, only to push for a peace treaty and a Palestinian state! He continues to do to this day. There are various indications that the tension between Israel and her Muslim neighbors are close to the boiling point. Iran's nuclear program has been accelerated and they have armed Hezbollah in Lebanon to the teeth. The Middle East is in the most volatile and dangerous position in decades. Egypt is unstable, Iraq is still wracked with violence – and the fighting in Syria threatens to drag the entire region (as well as a nuclear Iran, China, Russia and the US) into a chaotic war, with Israel caught smack in the middle of it. The U.S. is slowly distancing itself from Israel while aiding her enemies - as well as our own, especially Iran. President Obama is making terrible decisions and, as the U.S. is pulling away, Israel will find another protector which will bring her true salvation and victory, Jesus Christ! Not to be the boy who cried wolf, since every generation since Jesus has claimed to be living in the last days, but no other time in history have biblical prophecies been fulfilled to the extent that they have in the last 70 years. At any rate, according to biblical prophecy (which does not lie), the proven historical significance of the blood moon tetrad falling on the Jewish Feasts as well as the prophetic word given to Mark in 2012, signal that "something big is coming".